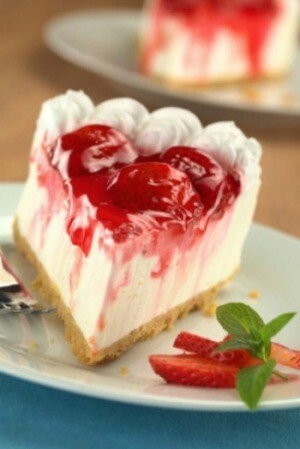 Strawberry cheesecake is a "to die for dessert" that you don't have to wait to have next time you eat out. This page contains strawberry cheesecake recipes. Heat oven to 300 degrees F. Combine crumbs and margarine. Press into bottom and sides lightly oiled 9 inch springform pan. Beat Ricotta cheese until smooth. Add 1/4 cup sugar, flour, egg yolks, lemon peel, and vanilla; mix well. Stir in and blend sour cream. Beat egg whites until stiff. Fold into cheese mixture; pour into crust and smooth top. Bake 1 hour. Turn oven off. Cool 1 hour in oven with door open. Remove and chill overnight. Puree 2 baskets of berries, 1/2 cup sugar, and lemon juice. Strain sauce; cover and chill. Arrange remaining berries on top of the cake and serve with sauce. Place evaporated milk, cream cheese, egg, sugar, flour and lemon peel in blender. Cover and blend until smooth. Pour into crust. Bake at 350 degrees F for 35 minutes or until center is set. Cool completely. Arrange strawberries on top of pie, drizzle with jelly.